Me and my buddy tried this many times now but I guess our builds aren't for Pvp. We nearly finished all maps but this one feels like impossible. If anybody is interested in doing this with us you can add Ryouku__92 and Reko__09. 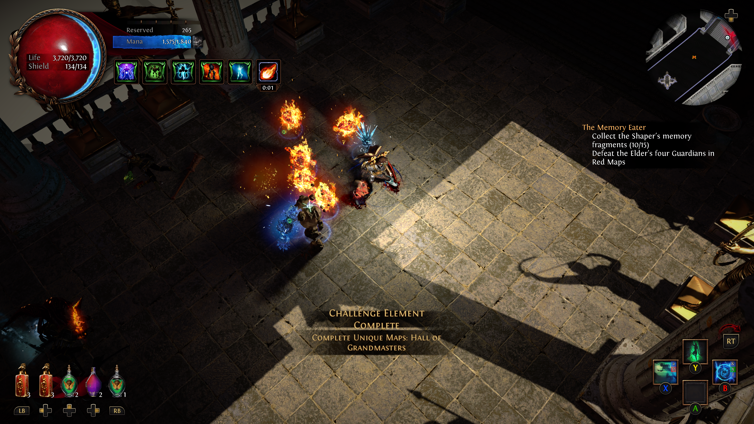 Completed with - https://www.pathofexile.com/forum/view-thread/2210643 on Xbox last league. Very expensive to get what you need on console (mainly the jewels). Very fast mapping build and a fun change of pace. Was able to carry 2 other people the 2nd time I went through also. You should use hit and run tactics as some enemies towards the ends can 1 shot you and your golems. Under my character tab you can look at Golem_Meister to check gear and stuff. The most usefull advise, I found on internet, reddit in particular, was to make use of Balefire with its' Scorching ray AND Purity of Fire plus Ruby Flasks enhanced against burns.